One of my favorite parts about being a part of the podcasting world is getting to chat about topics that we often feel scared or shameful about. Whether it’s our use of cannabis to support our health or how our expectations of fertility are forced to change amidst unexpected circumstances, having a platform that allows me, my guest and you to feel comfortable opening up about these things is by far the most rewarding part of my job. When I started The Healthy Maven many years ago I did not expect my business to look like this. Although to be honest I did not expect it to be a business at all…though I will say I’m pretty damn proud of what we do! This week’s episode is no exception. 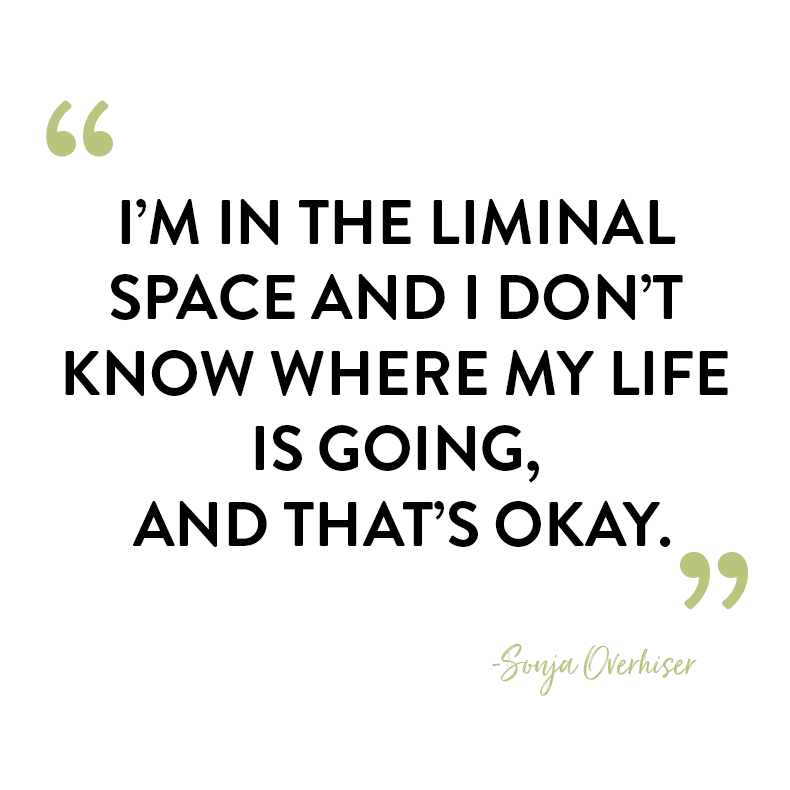 Sonja Overhiser, one half of the duo behind A Couple Cooks is on the podcast today chatting about her own struggles with infertility, adoption and getting a cancer diagnosis. Her story is nothing short of inspiring and I’m honored to share this episode with you today. Don’t forget to preorder their new cookbook, Pretty Simple Cooking HERE! What questions do you have for Sonja? 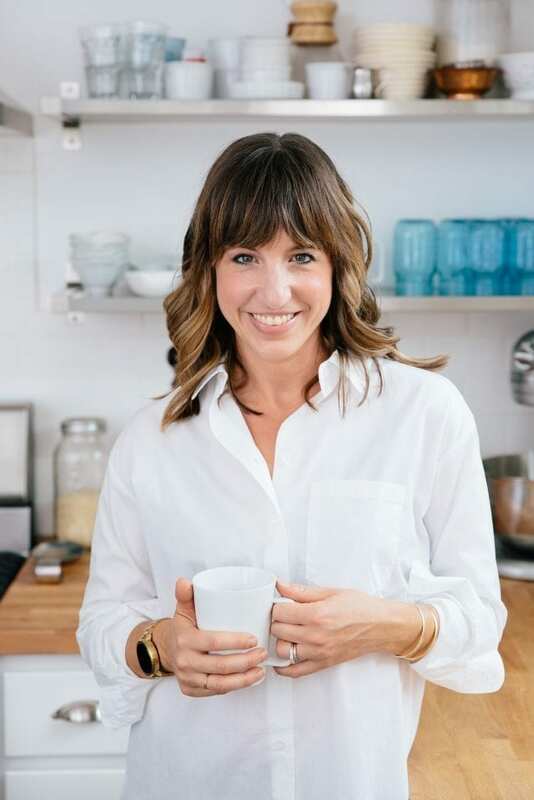 The post Episode #47: Sonja Overhiser from A Couple Cooks appeared first on The Healthy Maven. The post Activated Charcoal Benefits for Teeth, Skin, Digestion, and More appeared first on Avocadu. I truly believe that one of the most important lessons in “adulting” is how to build the best charcuterie meat board. Okay fine, employment, taxes, general life survival skills, those probably come first. But the charcuterie board? Don’t underestimate its necessity. I’ll never forget my first charcuterie board. C and I were 21, living in NYC and so excited to be hosting our first dinner party. Buying all the ingredients for the board felt so mature, including our stop at the fromagerie to buy “fancy cheese”. Also I’m pretty sure we paired it with $3 Trader Joe’s wine because we spent all of our money on cheese! Nevertheless, it was my first lesson in that so long as you invest in quality ingredients, the “rules” of the charcuterie board really don’t matter. There are endless meats, cheeses and accoutrements to build the board, but I truly believe that making it your own is half the battle. I’m going to give you an outline of ingredients to buy so you know where to start, but feel free to experiment. This charcuterie board typically feeds around 8 people, so don’t be afraid to double everything. Though I don’t suggest halving it because let’s be real, who’s complaining about having leftover meat and cheese? 1. 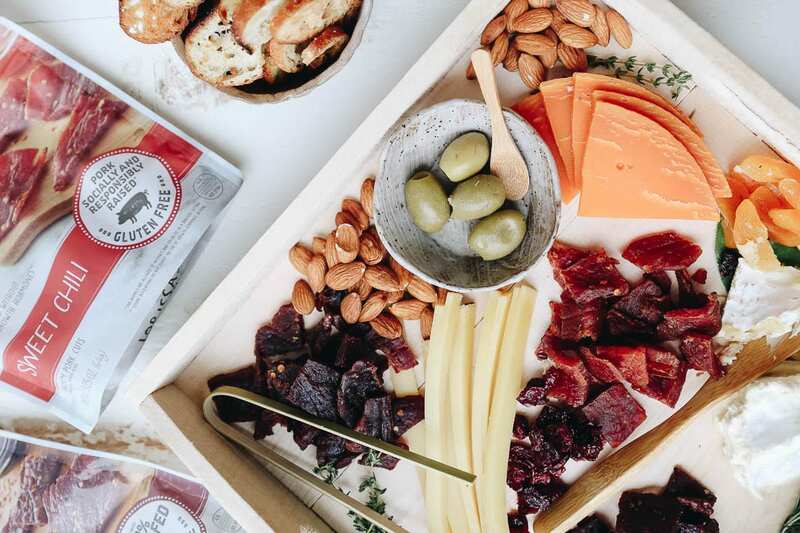 Meat – I like to stick to around 3 options when it comes to meat and if I’m being totally honest, I almost always reach for Lorissa’s Kitchen steak strips and chicken cuts when building my charcuterie boards. Like I said, quality is important. 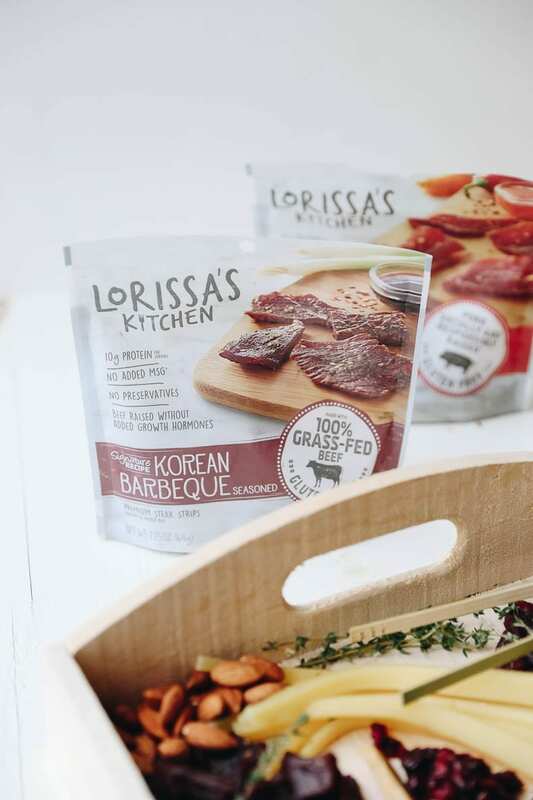 Lorissa’s Kitchen is a fabulous You can find Lorissa’s Kitchen at Target, Walgreens, convenience stores and even Amazon.com. I like that the steak strips are made from 100% grass-fed beef and the chicken cuts are raised without antibiotics or added growth hormones; all products are packed full of delicious flavor, free of preservatives, MSG, added nitrites and gluten. 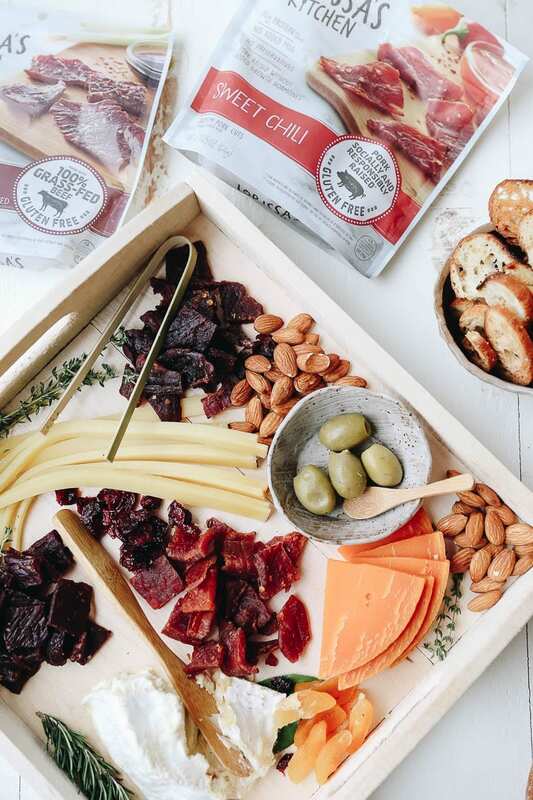 They also have the awesome benefit of pairing amazingly with cheese and their website also shares info on which meats pair with which cheeses on each product’s page. I think by now you all know I love my Korean Barbeque Beef but I also like adding the Ginger Teriyaki Chicken and Szechuan Peppercorn Beef for some variety on the board. Lorissa (yes she’s a real woman! 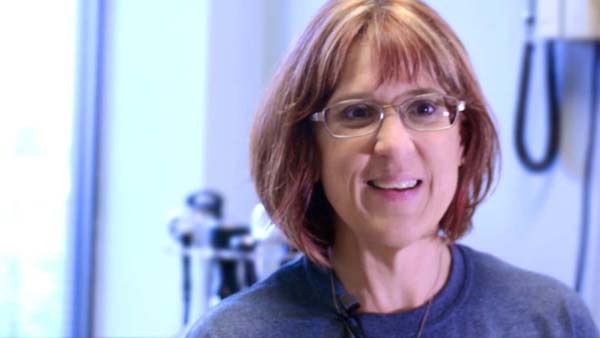 #girlboss) set out to create delicious, healthy snacks that would keep her family well nourished, without sacrificing the quality and responsible ingredients she cares about. I love that this was her mission and it’s exactly why I think it’s the perfect addition to the best charcuterie board. 2. Cheese – like the meat, I like to go with 3 cheese options. I usually go for one hard cheese, 1 soft cheese and 1 “fun” cheese, which usually means something with an interesting flavor or from a sheep or goat. Give variety so there’s a little something for everyone. 3. Crunch – You gotta get a little crunch action in there. This is where things can get fun. I’ve been known to throw some popcorn on there (in a pinch!) but the classic option is nuts. Toasted pecans, marcona almonds or even those addictive Thai Chili Lime Cashews from Trader Joe’s are always a good option. And if you’re an olive fan, don’t forget those! The sky’s the limit, but aim for at least a cup of whatever you choose to spread throughout the board. 4. Sweets – It’s not a charcuterie board without some sweets. Grapes, figs, and dates are all nice options. I’ve used raisins and craisins before. C’s personal favorite is fig spread (when we can get some from his uncle’s fig tree!) but local honey or marmalade is also a great alternative. For the hard sweets, go for a cup spread throughout the board, but for the liquid aim for around a 1/2 cup. 5. The Vessel – You need something to put all this food onto! Whether it’s crackers, bread or even sweet potato toast, be sure to pick a vessel of choice. My personal favorites are crostini or some crusty french bread. Really can’t go wrong with either. Aim for at least a loaf of bread and 4 cups of crackers. 6. 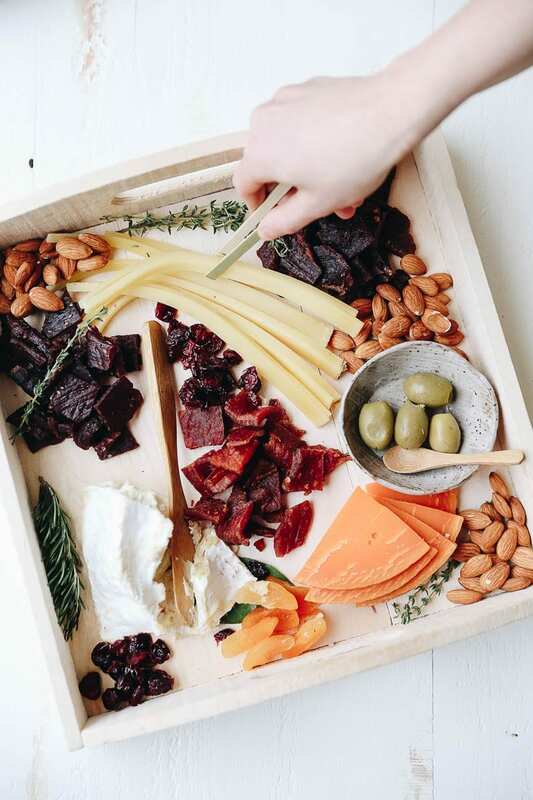 Decor – Now I’ll admit that in a hurry, I totally skip this part, but if I’m feeling fancy I always like to up my game with a little charcuterie board decor. Fresh herbs are always a nice touch, a pretty cheese board, nice bowls for almond bits or liquid sweets. Small signs for cheese and meats to help people differentiate between each is always a nice touch but based on my poor writing I almost always skip this part. No measurements on this, just have fun! Place all ingredients (except vessel) on a flat board or tray, spread out evenly. Place vessel (bread, crackers etc…) in a basket next to tray. Provide extra dishes for olive pits or cheese skins. Serve immediately or store in fridge (covered) until ready to serve. Disclaimer: This post is sponsored by Lorissa’s Kitchen. I’m excited to be working with them for the third year in a row! Thank you for supporting the brands that help make THM possible. What do your charcuterie boards look like? What feels like “adulting” to you? The post How To Build The BEST Charcuterie Meat Board appeared first on The Healthy Maven. Welcome to the 316th LITFL Review! Your regular and reliable source for the highest highlights, sneakiest sneak peeks and loudest shout-outs from the webbed world of emergency medicine and critical care. Each week the LITFL team casts the spotlight on the blogosphere’s best and brightest and deliver a bite-sized chunk of FOAM. Welcome to the 193rd edition of Research and Reviews in the Fastlane. R&R in the Fastlane is a free resource that harnesses the power of social media to allow some of the best and brightest emergency medicine and critical care clinicians from all over the world tell us what they think is worth reading from the published literature. Airway management in trauma is full of dogmas most often not supported by evidence. This article is the most comprehensive and intelligent written on this topic in years – simply a most read! This is the best written guide to mechanical ventilation in the emergency department that I have ever read. Highly recommend it for everyone. Lewis J, et al. Acute Management of Refractory and Unstable Pediatric Supraventricular Tachycardia. J Pediatr. 2017 Feb;181:177-182. For Pediatric SVT, go big… with your dose of Adenosine. This is especially true for those who are more likely to be refractory to standard 0.1mg/kg dose (like kids < 1 year of age). 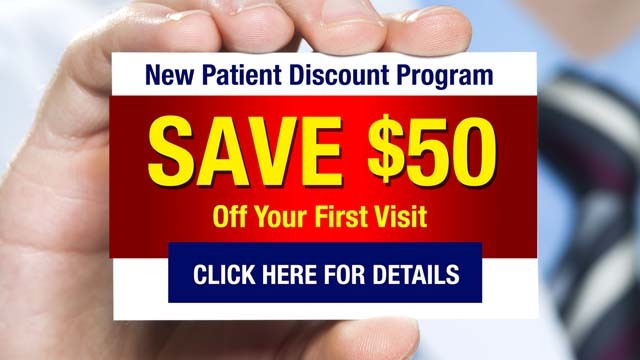 Start with 0.2 mg/kg dose. Can we use the presence of cardiac standstill on US to declare death and stop resuscitation? The REASON study showed a small rate of ROSC in this group but, this article questions the basic premise of using cardiac standstill for prognostication since it’s unclear if all providers agree on what standstill is. In this study, inter-rater agreement was moderate at best (kappa = 0.47). This variability reflects a lack of a single definition of standstill as well as training and skill in assessment. The authors call for a unified definition of standstill which would be a good start. Another small prospective article reminding us that the use of POCUS in cardiac arrest must be done mindfully. This group showed longer pauses in CPR when POCUS employed but, did not look at patient centered outcomes. Bottom line isn’t to avoid POCUS but rather to understand the potential issues and apply it intelligently.